Hi all! All My Favorite Things February Release is now available at MFT Store. So many amazing and fun new products, I have so much fun play with it! I stamp, color the images using copic then die cut it. Adorable card! I love how you stacked the sentiment. Great design! Super cute card! I love the colors you've chosen. Thanks for sharing! There's a party going on right there on your card. How fun! Awwdorable!! Love the font on the sentiment!! It's so elegant!! Love the colours you used! Really cute card. Love the stack of animals and your coloring is fabulous. your coloring is great. i love this stamp set. These birthday critters are soo cute. Such lovely card! Love the party scene you've created! Love, love, love your adorable card! You have an adorable party going on there. So cute!! What a fun color palette you chose for this! That is definitely a party I want to attend. Thanks for sharing with us. Love how many of the Birth-Yay critters you used. Great release. Such a fun birthday card! This is so cute!! Fabulous coloring! Melania, your card is so great! Your coloring is always gorgeous and the design is sweet too. Thanks for sharing this fun card with us. I love all your animals and the way you colored them! Great card!! Love the coloring, adorable card! Fabulous little party scene on your card. Birth-Yay is such a happy stamp set! Love the party and soft colors you used!! Fun scene for your adorable card! Love all the critters! I love everything about this card. The animals are adorable, the sentiment pops, and the coloring is awesome! Adorable card! Love all the details! 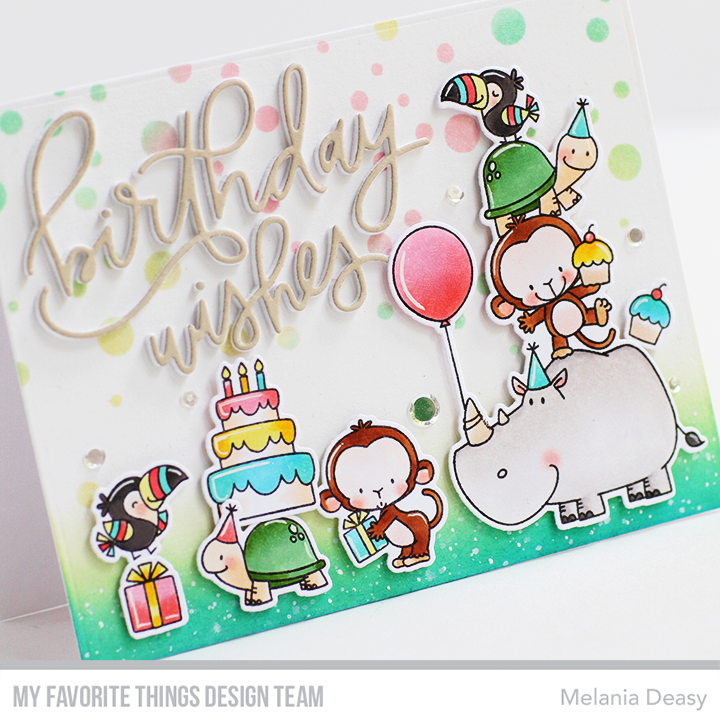 Love this design Melania, the critters are super cute and that birthday wishes dies is fabulous! Thanks for the inspiration! You really know how to throw a fantastic party full of charming animals and confetti! Une parade d'animaux tous plus craquants les uns que les autres, une carte adorable et quelle magnifique colorisation! Such a fun card. Looks like a great party. Oh, I LOVE the fab background you did for these cutie-patooties! What a fun set and card! 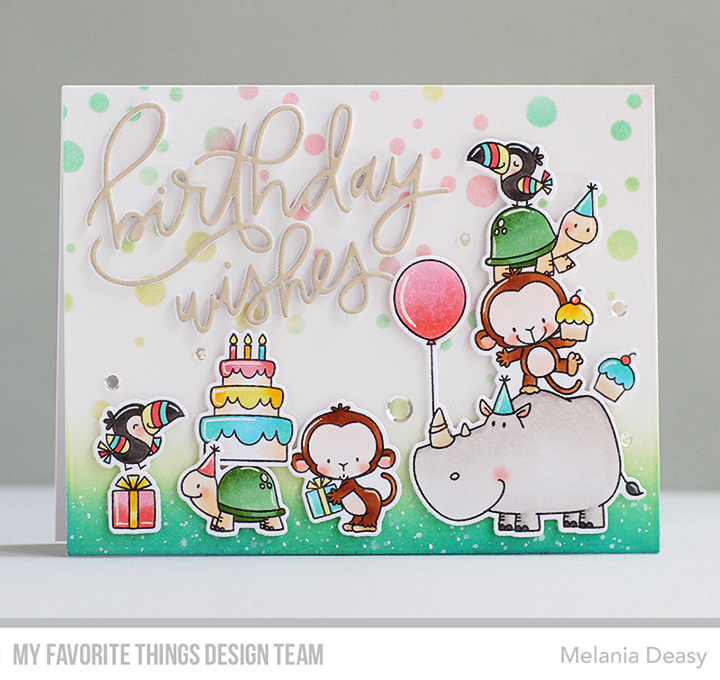 Cute and fun card, I love the ombre background too! Such a cute card! Adorable and cheery card. 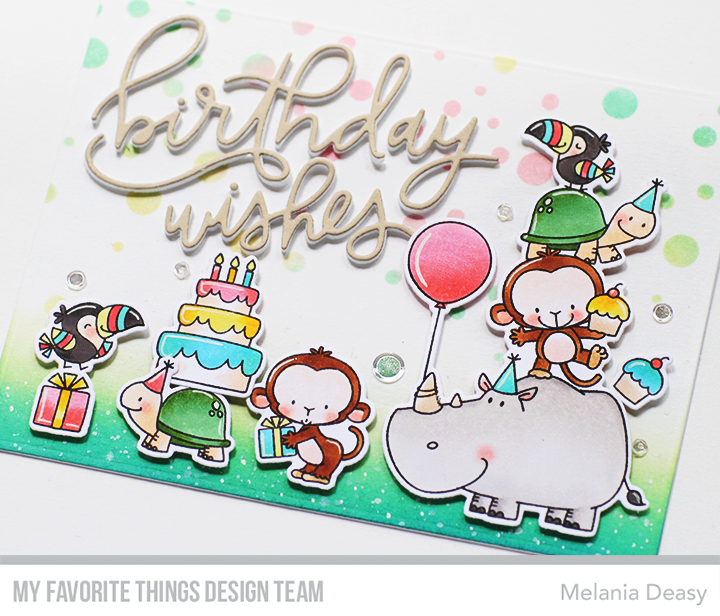 The critters in the set are so cute and they make such a wonderful scene on your card. Amazing card design using all the critters in the set. Can hardly wait for my set to arrive! Your card is adorable. I love this new birthday stamp set! What a bright, happy card - love it and how you used all the adorable image stamps! So cute, Melania! I love how you used all the critters from this set to create your card. It really is a party! The confetti background is a lot of fun. So cute! I love those cute little animals! Fabulous card! I love all the little critters you used! Such an adorable card! I love the colors, design and those cute animals! Awesome card, Melania! Love the colos & that new Birthday die! What a fun group of party animals! Adorable! So adorable. I can't wait to get this set. Oh my--this scene is so cute! Oh what an adorable scene! Fabulous colors, coloring and design. Such a happy and festive card. Such a fun card. Love your coloring and the dimension you added to the card. I love all your critters and colors on your card! So adorable! !